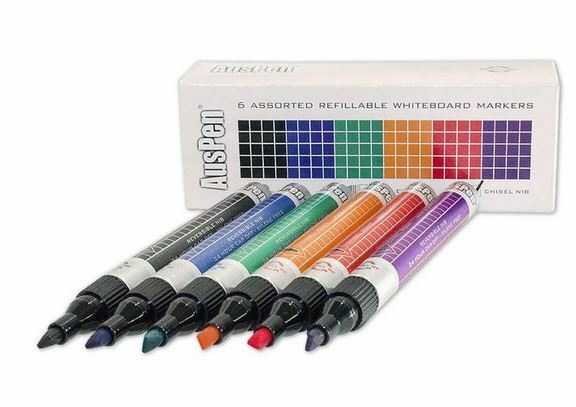 Whiteboard markers are being used on a daily basis in schools, universities, and institutions. Many families use whiteboard markers in their homes. When you pull the cap off of a whiteboard marker, do you ever consider what is inside of it? We have, and that’s one of many reasons we decided to create AusPen whiteboard markers. Most people are familiar with the smell of a whiteboard marker. When you twist off the cap, the scent of chemicals quickly reach your nose. The ink inside the majority of whiteboard markers consists of a harsh chemical called xylene. Xylene is a hazardous chemical that can come with serious health consequences. Xylene causes headaches, dizziness, and nausea when inhaled or ingested. Have you ever been writing with a whiteboard marker for an extended period of time and you find yourself getting dizzy? This is a direct side effect of the xylene in the whiteboard marker. Most companies claim that xylene is necessary because it helps the ink adhere to the whiteboard yet we found an alternative. If you are using an AusPen whiteboard marker, you will not feel those side effects. We are proud to say that our whiteboard markers are xylene free and low-odor. Our markers are based mainly in a denatured alcohol which is better than harsh solvents and chemicals that most whiteboard markers are filled with. Many schools and companies are making an effort to go fragrance free due to the large number of people that suffer from chemical sensitives and asthma issues. Our markers will not aggravate those conditions, making AusPen a top choice for organizations committing to a fragrance free environment. It should be noted that like most other dry erase inks Auspen Ink has a flammability rating and the MSDS report for each of the colors recommends the following Health and Safety Warnings. If your eyes are exposed, rinse with water for several minutes, remove any contact lenses, and consult an oculist. If skin is exposed, wash with plenty of soap and water and call a physician. If swallowed, dilute water and salt water and call a physician. If directly inhaled, go outside for fresh air and consult a physician. If you are sick of that strong, potent smell filling your space each time you write on your whiteboard, switch over to AusPen whiteboard markers and breathe again.